Pieces might sound like a lot of other early 1980s slasher films, since it’s about a shadowy maniac who chops up pretty college girls. 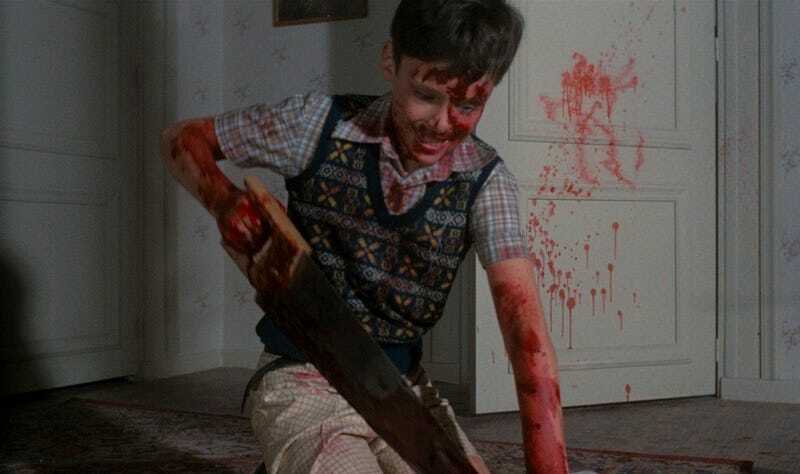 But anyone who’s seen it knows that Pieces is one of the most WTF entries in the genre—and now it’s getting a smashing new Blu-ray release, full of extras that highlight its awesome, gruesome uniqueness. Juan Piquer Simón’s 1982 film was mostly filmed in Spain—despite aggressive set dressing (like an American flag and a framed photo of Ronald Reagan) to convince viewers that it takes place in Boston. Like many European exploitation movies at the time, its actors, including real-life married couple Christopher George (who also starred in Lucio Fulci’s City of the Living Dead) and Linda Day (of TV’s Mission: Impossible), appear to be judiciously dubbed, even when they’re speaking English. It’s off-putting, to say the least, which is absolutely part of the trashy fun of the film. But it’s not just blood and guts. Pieces is full of total insanity, which has sealed it into the firmament of cult classics. Day’s character, a famous tennis pro-turned-cop, is considered a sensible choice to go undercover at the college to help catch the killer. The police rely heavily on a random student to help with their investigation, even letting him tag along when they’re about to nab a dangerously violent suspect. Pieces’ three-disc set (out March 1 from Grindhouse Releasing) includes both English and Spanish versions of the film. Both are presented in sparkling new 4K transfers, and the Spanish “director’s cut” (original title: Mil Gritos Tiene La Noche, or A Thousand Screams in the Night) has three extra minutes of blood-dripping footage. Other extras include a new audio commentary by actor Jack Taylor (who plays one of the main suspects, a college professor who seems to have odd feelings for his female students). Plus 42nd Street Memories, a doc that contains the fond memories of grindhouse vets Bill Lustig (director of Maniac), Larry Cohen (It’s Alive), and others. There’s also a CD containing a remastered version of the original soundtrack. But the absolute coolest part of the whole thing—so covetable it’s limited to the first 3,000 sets sold—is a scaled-down copy of the naughty jigsaw puzzle that Pieces’ disturbed killer is obsessed with throughout the film. All photos courtesy of Grindhouse Releasing.